A pulse of nostalgia went through me when I first booted up Forged Battalion. Its chunky units and buildings have a Command & Conquer: Generals quality about them. I may be reading too much into it, but Forged Battalion is a game from Petroglyph, a studio formed of ex-Westwood developers. 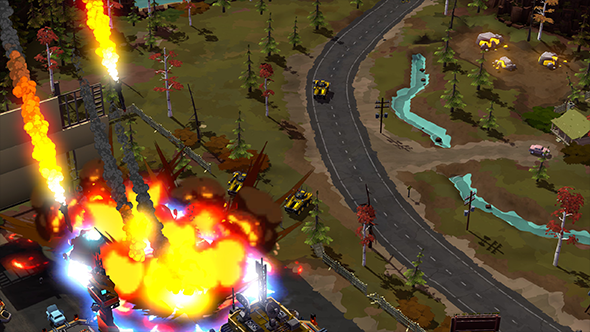 However, this isn’t a retrospective game: Forged Battalion has thrown out a 20-year-old staple of the RTS genre and replaced it with something new. Here are what we think are the best strategy games on PC. Forged Battalion doesn’t have multiple factions, a mainstay of RTS games since Westwood’s Dune 2, released back in 1992. Instead, in Petroglyph’s game, you design your own armies. The faction builder is a multi-stage process. The first stage is the technology screen. There, you are able to cash in research points you have earned in single-player and multiplayer matches to buy new technologies. There are multiple tiers of these and you can eventually unlock them all. 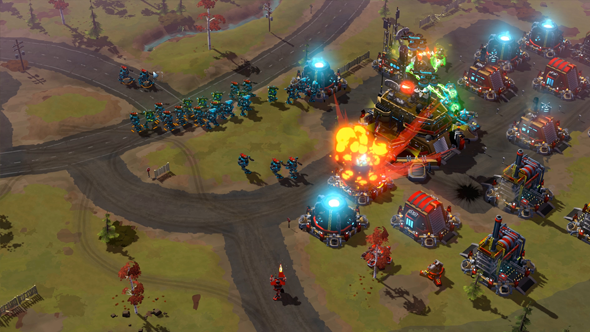 Technologies cover a whole host of things, such as new weapon types, chassis and armour types, and even super weapons that can wipe out whole hosts of units in a single blast. The next stage is the unit builder. Here you can fit the tech you have unlocked to the units you will be taking into the battlefield. Say, for instance, you have earned the research points required to unlock regenerative armour and the plasma bolt generator, you can then make a heavy vehicle which heals itself and fires armour-eating purple plasma at your enemies. If you have unlocked the mech tech then you can replace the vehicle’s wheels with mechanical legs that can crush enemy infantry. Of course, the more tech you fit to a unit, the more expensive it becomes and the longer it takes to build. It is up to you to design a faction that is not so expensive that you fall behind in the arms race of the early game, and is not so cheap and flimsy that you become outgunned in the late-game. The final stage of the process is the faction overview. It is there that you can see all the unit designs you are taking into the battlefield. You can only take four different designs for each unit type – infantry, light vehicle, heavy vehicle, and aircraft – so as you unlock more technologies you are going to have to be selective about what sort of weapons and abilities you want to field in battle. The faction designer is the heart of Forged Battalion and it is already a robust system, offering you a load of options with which to specialise your army. It does mean you will want to grind through the campaign before taking your army into multiplayer, though. The tier 1 tech you have access to at the start of the game simply cannot compete with all the power and abilities that the later tiers offer. So, if you are new to the game and went up against someone who only had a few more hours of game time, you would find yourself outclassed. 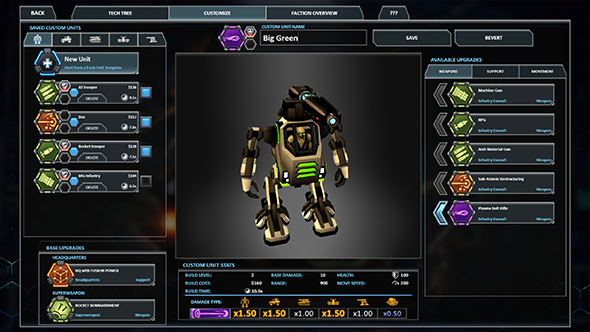 While your army would be cheaper and faster to build, simply by token of the lower-level tech that your units are fitted with, that would not make up for the advantages your opponent’s heavy armours and higher-damage weapons. Forged Battalion’s developers are already talking to players in the Steam forums about this very problem, so it may be that this will be changed through Early Access. 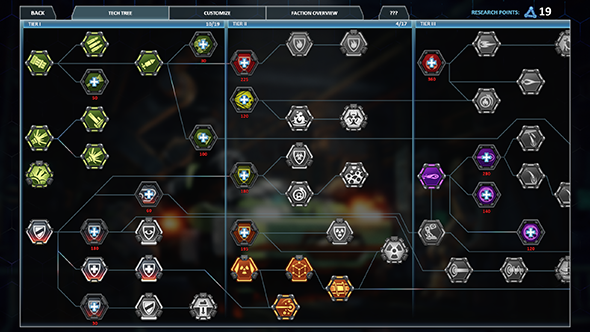 The solution may be to open up the tech tree completely from the start of the game, or to give a faction a limited number of tech tokens, so rather than each faction being able to access everything eventually, you can only ever access a branch of the tech spread available. The actual battles in Forged Battalion will be familiar to anyone who has played an RTS game in the last 20 years. You start each map with a headquarters and a harvester. You need to build a refinery, power plants, unit factories, and grow an army while making sure your economy does not grind to a stand still in the process. You do not have any builder units, however, as instead you can place buildings anywhere in a small radius around your headquarters. On some maps there are outposts you can capture with infantry, letting you build second bases in their surroundings. This can be vital in long games where your harvesters have chewed through all the resource deposits in your vicinity and are travelling further and further afield to get you cash – placing refineries at captured locations around the map can cut down that journey time significantly. It is a lot of fun leading an army of units you have designed, particularly when a synergy you intended works in practice. At one point, I found my armies were being destroyed by the enemy’s turrets when I was trying to destroy their base, so I researched the tech to design an infantry unit with a repair beam. The beam does not work when the unit is on the move, but when it comes to sieging an enemy base it is perfect for topping up the health of tanks while they are under fire from gun emplacements. For me, that meant I could strip out the regenerative armour of those units too, replacing it with thicker, cheaper armour plating. There are parts of Forged Battalion that feel under-cooked, betraying its Early Access status. The AI in single-player is pretty dim. On the lower difficulties it basically just sits in its base and on the top difficulty it builds up a great big army and tries to swamp you. It doesn’t go for anything more complex, like hunting down your harvesters, nor does it seem to match its assault to the kinds of troops you are churning out. I also hope that over the Early Access period we are given more complex unit commands. I would like to be able to set up patrol routes, lay our waypoints for my army to travel by, or even make all my troops move at the same speed as my slowest unit. It is always a pain to send an army of mixed units to the enemy base only to find they all arrive at different times and get wiped out in stages. It is still early days for Forged Battalion, with six months of Early Access ahead of it, but it is a promising start for anyone looking for a chunky, ‘90s-style RTS. 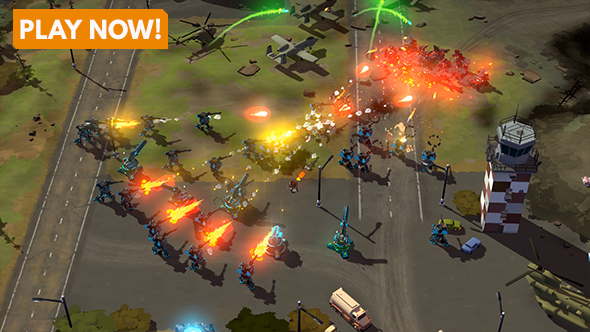 If you want to get involved, Forged Battalion is out now on Steam.